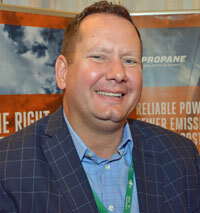 Propane is expanding in production and the options for its use. During the recent National Association of Farm Broadcasting (NAFB) convention in Kansas City, Missouri, Cindy caught up with Cinch Munson from the Propane Education and Research Council (PERC) who said that there are 102.4 million barrels of propane in storage right now – a nearly 30 percent increase from a year ago. He credited strong production and a mild grain-drying season for the big inventories right now. Munson said new propane engines offer lots of advantages, especially in the ag markets. He added the positive supply outlook for propane and its domestic, environmentally friendly profile, as well as more machinery running on the fuel, make propane a great choice. Munson said consumers should talk to their local dealers or go to PERC’s website for more information.